Rite Stripe's White, Essie's Bermuda Shorts, China Glaze's In The Limelight, Turned up Turquoise and Luxe and Lush. My thumb and pinky fingers are In The Limelight, my ring and pointer fingers are Turned up Turquoise and my middle is Bermuda Shorts. Then I very carefully because my hand was shaking put three stripes on each finger and finished off with a coat of Luxe and Lush. You know, because it was an 80s party and there can NEVER be "too much" when you're talking about the 80s. They kind of remind me of those bad junior-high school picture backdrops. That and Kids Incorporated. And here we are. Please note that I also have three bracelets of different colours on my other arm. And yes, I am wearing sequin shorts. Also, the outfit that The Remix is wearing is the same outfit he was wearing when we first met. Well, except for the glasses and gold chain. Still, he makes quite an impression, no? Haha!! ps. Kimberlee - you've been a doll and commented on just about every one of my Nail File posts but you don't have your email set up, so I can't say thank you (which is why I'm doing it here). So...err...thanks!! Haha! loving the outfits even more!!! The 80s nails are awesome and the 80s outfit is even better! I impressed with how all out you went! 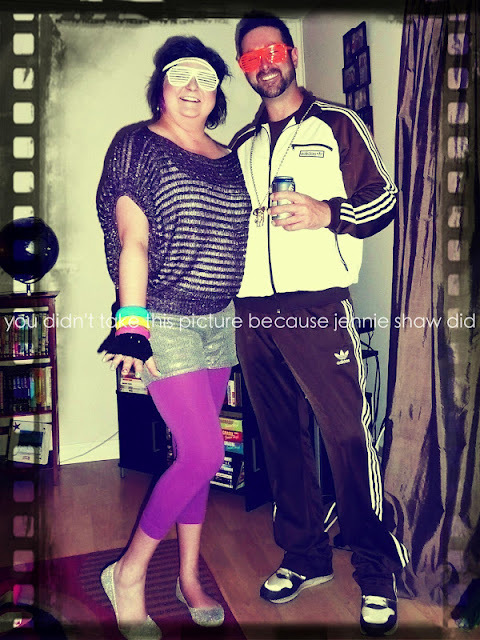 I LOVE the 80's theme!!! So fun!! And your nails looked great. I did an acid wash denim mani once that if I added neon tips with colors like these, would have been perfect for an 80's party. OMG those are some rad nails!!!! Brilliant! That sounds like so much fun! Love the nails its perfect! LOVE the nails they look awesome!!!! Totally goes with the 80's look! Kind of weird that the 80's have come back. My college roommate and I put up posters just for fun one day saying that the next day was 80's Day. People participated and it became a fun annual event. Your nails look really cool and "retro." I love the 80's. Those are all such pretty colors. I want to get some more China Glaze nailpolishes. I only have a few. Love it! Love the 80s! You are so talented! your nails look ridiculously awesome!!! Oh my gosh!! I love it! Your nails are amazing! WHAT?! Your nails are like, totally awesome. For real! Those colors are great!